This short video touches on the most important details regarding a Zapata trip. In this longer video I discuss every detail regarding a week-long trip to Zapata, staying on and fishing from the yacht Georgiana. The Zapata Peninsula is important to Cuba in many ways. Bordering the Bay of Pigs, this area experienced the infamous failed invasion of US -backed troops. This event was extremely instrumental in the Cuban view of history, and signs expounding their victory over invaders still greet visitors as they drive in to the small fishing town of Playa Larga. Zapata is also important from an environmental perspective. Similar to the American Everglades, the Zapata Peninsula is mostly a swamp of sawgrass and mangroves, and now makes up the largest national park in the Caribbean. Its abundant variety of birds native to the area attracts groups of ornithologists from the world over. It is also home to a large population of the protected Cuban Crocodile. Relevant to anglers, this swampland of mangroves creates an amazing nursery for flats fish, as well as the food that those fish feed upon. Bonefish thrive here, and there are massive numbers of them, ranging in size from true juveniles to fish pushing double digits. Tarpon also love this habitat, and are found reliably in the channels between Zapata’s many cayes, inside the mangroves, and on some of the ocean-side beaches. They range from adolescents waiting to join the migration of mature fish, to larger fish that will sometimes show themselves during the late Spring and Summer. This is also one of the most reliable Permit fisheries in all of Cuba, with an enormous variety of habitats where anglers seek them with crab imitations. Many grand-slams happen in Zapata, and Super Grand-Slams as well as there are also good numbers of Snook patrolling the white sand beaches of the small islands. Of course, Snappers, Jacks, Barracuda and even Grouper are here in good numbers. Some of the notable attributes to this trip include its proximity to Havana. While many fishing destinations in Cuba include long road-trips, the port is only a two and half hour drive from Havana. One of the other unique details of this experience is that all anglers fish three days in double skiffs, and three days in a single. This is not done almost anywhere else, and results in guests spending more time fishing, and also in being able to direct the guide to do exactly what they prefer. 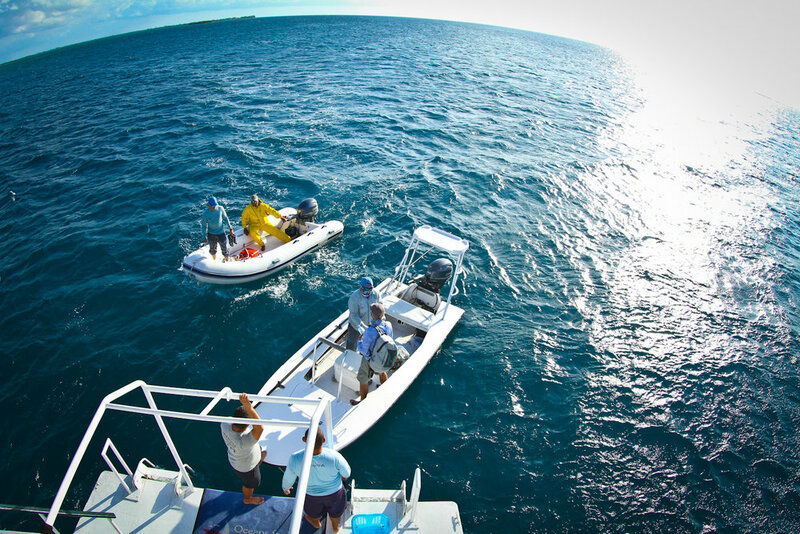 The days in double skiffs concentrate fishing in slightly deeper water, with the majority of the day seeking Tarpon. 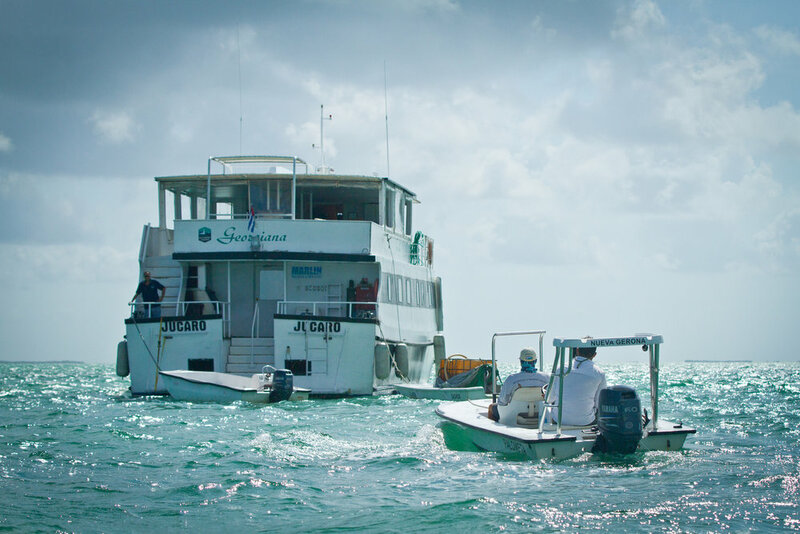 The single skiffs are able to access massive shallow flats, and anglers wade for Bonefish, pole mangrove shorelines for Permit, or ask their guide to find Tarpon habitat. Guests arrive from Havana and spend their first night in port aboard the yacht Georgiana. This live-aboard is very comfortable, and has four single rooms and two doubles. Maximum fishing groups are eight. Early the next morning Georgiana leaves port for a three hour voyage to the remote interior of the Zapata flats where it rendezvous with the guides and skiffs. Fishing starts immediately, and anglers have almost six full days of excellent and diverse flats fishing. The staff aboard Georgiana are all Cuban natives, and do an amazing job of making guests comfortable. The food is first-rate, consisting largely of fresh seafood, and the mojitos flow abundantly. Guests feel pampered by this experience, and almost all rave about the level of attention and service provided to them.